Gear? Ooops! (part 2 of 2) | Tennessee Aircraft Services, Inc. When something embarrassing happens, it’s not a problem until someone else finds out about it. Unfortunately, you cannot easily keep a gear-up landing to yourself. It’s not like you can carry it off the runway yourself; if you leave it sitting in the middle of the runway, someone else will definitely try to land on top of it. The insurance adjuster will have to be called if you want any help paying for the event. The FAA wants in on the excitement too, not to mention the mechanic who’ll be contracted to make the repair. It seems simple enough: just lift the plane a few feet off the ground, extend the gear, and tow the plane off the runway. However, a lot of damage is often incurred during the recovery process. Too often, the people hired for the recovery know nothing about the Cessna single engine landing gear retraction system. They may not know anything about airplanes either. An automotive wrecker service is about the worst choice you can make. It’s pretty effective though: just lasso the tail cone with a steel cable and drag the plane to the ramp. 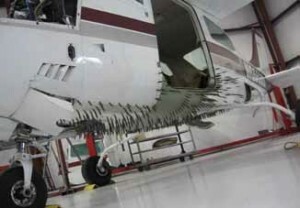 There won’t be much discussion with the insurance adjuster about repair costs once the tail feathers have been crunched into a wad of scrap (not-to-mention all the damage from the gear up landing). There are lots of proper ways to recover a Cessna from lounging on the asphalt. The prime objective is to do it without further damage to the plane. A quick and dirty (but better) recovery might lasso the propeller and drag the plane onto a tilt bed truck. After arriving to a nearby hangar, use standard wing jacks (always use proper jack pads) with a tail stand to lift the plane enough to drive the truck out from under it. Then the landing gear is extended and secured in the down position. One might also put short wing jacks in place (with jack pads) and a strap lift on the propeller. This could lift the cabin high enough to get temporary support under the belly like a small trailer or platform of some sort. Then the short jacks would be replaced by standard wing jacks and tail stand so the plane could be lifted high enough to extend the gear.. Your insurance adjuster will likely have suggested or even recommended shops capable of making the repair. But remember, even though the insurance company will aid in paying for the repair, it is ultimately your choice as to which shop will get the work. The repair contract is not between the insurance company and the shop, it is between you and the shop. This is a VERY important point. Your choice of shops will be based on many of the same reasons as the annual inspection shop: quality of workmanship, communication skills, professionalism, and knowledge of the work to be performed. Notice I didn’t include “cost” in the list. Once the first set of criteria is used there won’t be much shopping around for price. The long term cost of using the wrong shop will be much higher than whatever they quoted at the start. As with many major work items, things will look much worse before they look better. Before removing the belly skins, the excess weight of the propeller and engine are removed. It doesn’t take much prop blade damage to render the hub useless and thus the entire assembly useless. A new prop will be ordered and installed later. The engine will be sent to an outside repair facility and should return about the time the sheet metal work is done. The engine will need a tear down inspection to verify the airworthiness of all the components. This is not a mandatory requirement by the FAA, but most insurance companies are willing to pay for it. Lycoming and Continental each have service bulletins that refer to prop strike events. There is an FAA airworthiness directive for Lycoming engines that have encountered a prop strike, but it only requires removal of the accessory housing and replacement of a few components. The insurance company will pay for the inspection and any damage caused by the prop strike. They won’t pay for any extra stuff like new cylinders. I’ve sent many engines out for tear down inspections after a prop strike event at idle speed and none have been found with any damage. That being said, every prop strike is different so don’t assume yours won’t be the one that cracks a crankshaft flange. I’m still young, so I’ll keep watching. The aircraft configuration, landing speed, and landing surface all play significant role in the type and extent of the damage. Obviously, which gear are up or down has an impact on what gets hurt. Flaps extended or retracted change the initial contact point on the belly. Open cowl flaps will hold the nose a little bit higher for a short period. Having the hard mounted steps will change where and how bad the damage is. Slow airspeed causes first contact to occur further aft than higher landing speed. Landing on pavement merely scrapes the sheet metal and may grind deep enough to damage bulkheads but often doesn’t. Landing on sod will not only damage the skins but will beat the interior structure severely. Given the choice to cause less damage, land on smooth pavement. In the case at hand, all the gear were fully retracted and the gear doors closed. A “normal” landing was made with flaps extended on a concrete runway. The prop struck first curling the blades aft. Shock waves moved through all the rotating parts of the engine from the crank shaft flange to the magnetos and back up to the prop governor. Then the belly touched at the main gear mount bulkhead. The scraping damage began just behind the aft nose gear doors and extended all the way back to the main gear clam shell doors. The deepest damage was at the main gear mount bulkhead. The other areas just scraped through the outer skin and support doubler sheets. The internal bulkheads and stringers showed no signs of damage. A landing on a sod field would have bent several of these internal frames. The fuselage is braced and secured to maintain its rig. The damaged skins, doublers, and gear box strap are removed. All but one of these parts are simple flat sheets of Alclad 2024T3 aluminum. 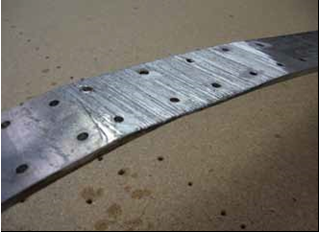 The strap is 0.190” thick and must be rolled to achieve the same shape as the bulkhead. As thick as it is, it must match the bulkhead or it will add stress to the assembly. The skins are only 0.032” thick and will easily form to the shape of the belly but a little work in the roller will help the fit a lot. The gear box strap showing how deep the scraping was. The gear box strap (in yellow) being checked for proper roll around the sides. Much of the hydraulic plumbing, fuel header tanks, electric fuel pump, fuel selector and fuel lines are removed to allow access for riveting. While everything is open, it’s a great time to thoroughly clean all the exposed structure. The replacement skins are cleaned and etched with Alumiprep, then washed with Alodine for better adhesion. Primer is applied for long term corrosion protection which the original plane did not have. Of course, it only lasted 35 years with bare aluminum so we expect the current owner won’t give it a thought when the new skins finally start showing signs of corroding. The green skin is the only one purchased from Cessna due to special shaping. The bare aluminum skins are primed on the inside and will be primed on the outside when the entire belly is repainted. The skins are installed in sequence from the aft of the belly toward the firewall. The forward skins overlap the aft skin. To keep the seams tight, the trailing edge of the skins are “broken” or slightly “flanged.” This slight bend of the last 1/8th inch of the trailing edge of the skin is barely perceptible but makes a world of difference in the skin appearance. This is not fast work. Each rivet is a separate job in itself and there are about 1700 of them plus more than 80 structural screws. After all the riveting is done, the airplane still has to be put back together. The opened hydraulic lines must be cleaned, purged, and reinstalled. The same must be done with the fuel system components removed earlier. With the structure of the belly now in tact, the heavy engine and prop can be reinstalled. The cabin doors can be installed and the new skins trimmed to fit the bottom edge of the doors. All the systems must be thoroughly tested before flying the plane is even a consideration. 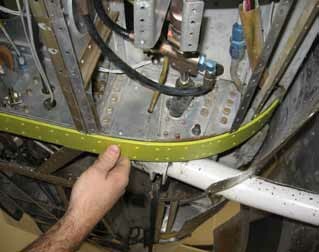 Not many repairs disturb almost every system in the airplane. If there’s such a thing as major surgery on a plane, this has been it. Inspections look at everything and various problems are repaired as needed but a gear up landing repair requires a different level of coordination and attention to detail for all the work to fit together. It requires technicians with skills in engine work, propellers, aircraft systems, and structures to coordinate their efforts and maintain continuity between the repairs. One of the replacement internal reinforcement plates cut to finish and ready for priming. Anytime an aircraft is received from maintenance an extensive pre-flight inspection is called for. This is not because we don’t trust the team of skilled mechanics that performed the work but because we understand human nature. Mechanics are just as capable of making a mistake as the pilot that forgot to put the gear down. Fortunately, post maintenance inspections and checks by several sets of eyes with proper time allows any errors to be found and corrected before that first flight. So, to get back to where we started last month; “There are those who have and those who will.” You’ve heard it. I’ve said it. You may have said it, but we really only believe it for the other guy/gal.” We really don’t want to be that guy (or gal).